It's amazing how once you've zeroed in on a specialty in a foreign country it seems to announce its presence everywhere. 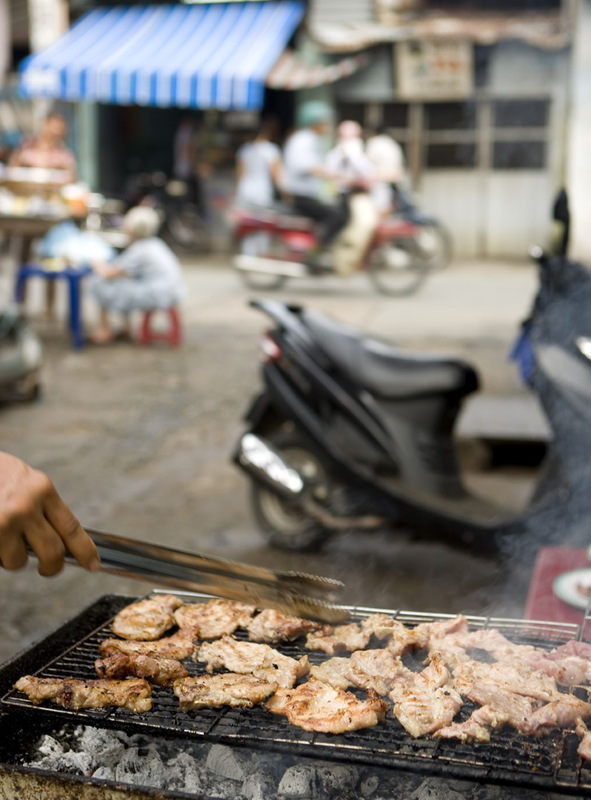 All the time we lived in Saigon I never once took notice of sandwich vendors grilling pork. 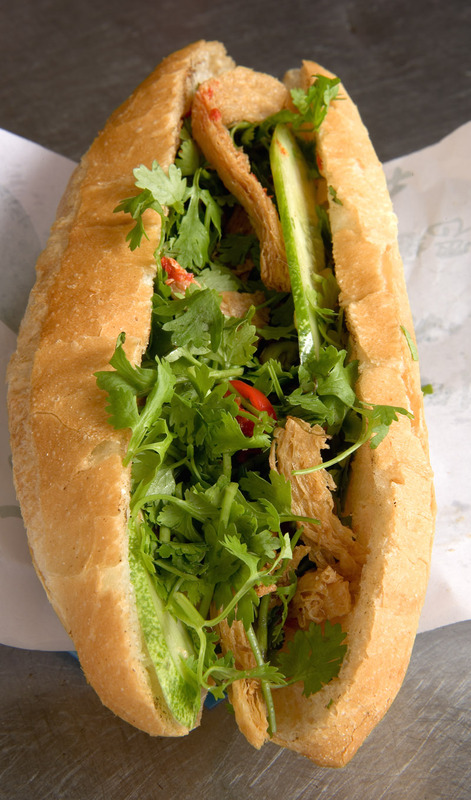 But in August, once we'd tucked into our first banh mi thit nuong, I began seeing stalls selling the sandwiches on every other corner. 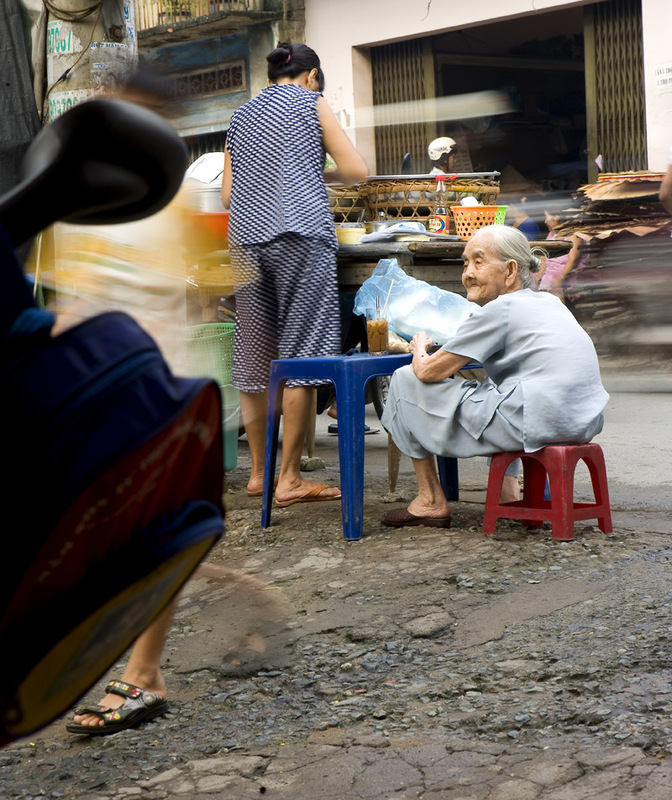 The side street leading to one of our favorite Saigon markets has two within spitting distance of each other. 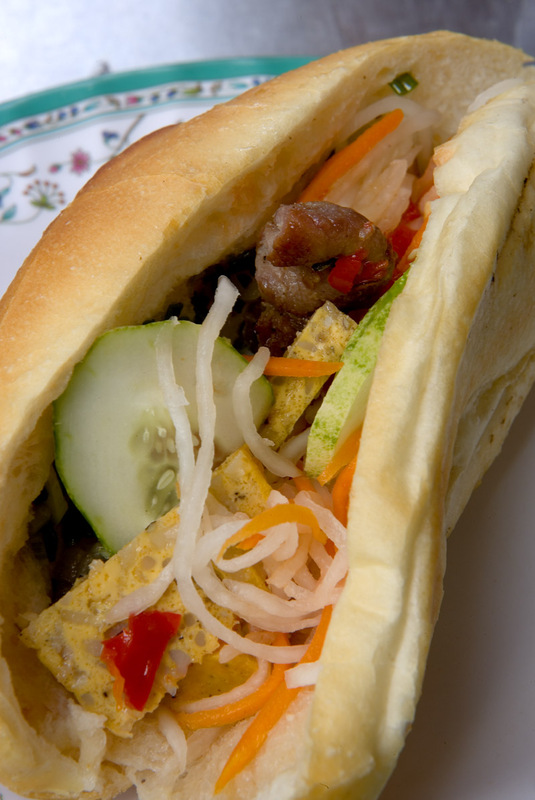 One is takeaway only, while another sits across the street from a few tables where you cam crouch on a toddler-sized stool, order a cafe sua da, and enjoy your banh mi in repose. chopped red chilies, and the usual daikon-radish pickle plus veggies. A sprinkle of fish sauce and a squirt of Maggi sauce and we were good to go. One of the things that made this banh mi experience so nice was the opportunity to watch the neighborhood around us awaken as we ate: kids on their way to school, women on their way home from market, old gents chit-chatting over a few glasses of coffee, a dad stopping in with his young son for a plate of thit nuong over rice (another specialty of the stall), and an elderly resident visiting with a vendor. 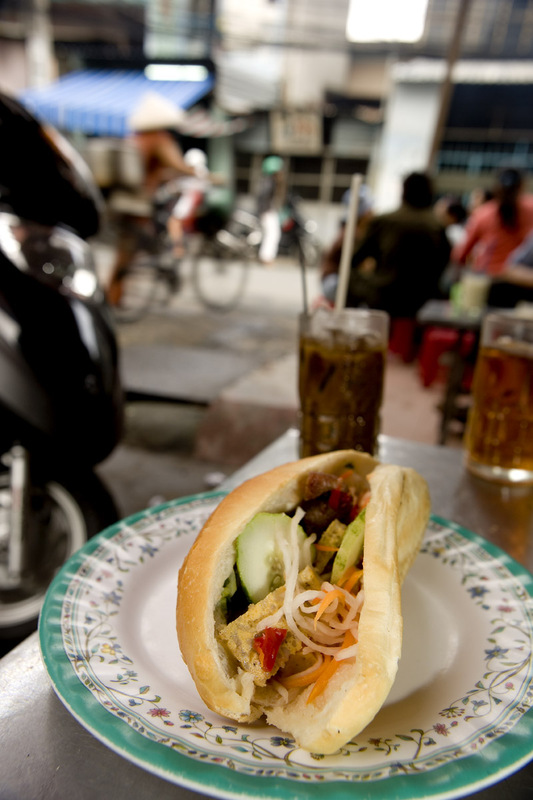 A few days later we had an encounter with a meatless banh mi behind Cho Cholon (Chinatown market). Since moving to Malaysia I've become somewhat enamored of skillfully crafted gluten products (aka 'fake meat') and this stall was doing a brisk business in vegetarian sandwiches. We had one made to order, selecting various 'sausages', 'pates', and 'meat' shreds to fill our baguette. Lovely to look at but, in the end, not quite satisfying. Maybe, even, just wrong (unless, of course, you don't eat meat.) Perhaps non-meat meats are best appreciated on their own, without the distraction of bread and other texturally satisfying elements such as cucumbers and zesty daikon and carrot pickle. They're no substitute for thit nuong - or, for that matter, a thick slather of liver pate. yummay.. i was just wondering if you know what the frittata cake is made of? and does the bread get soggy in the hot and humid weather? Sigh! 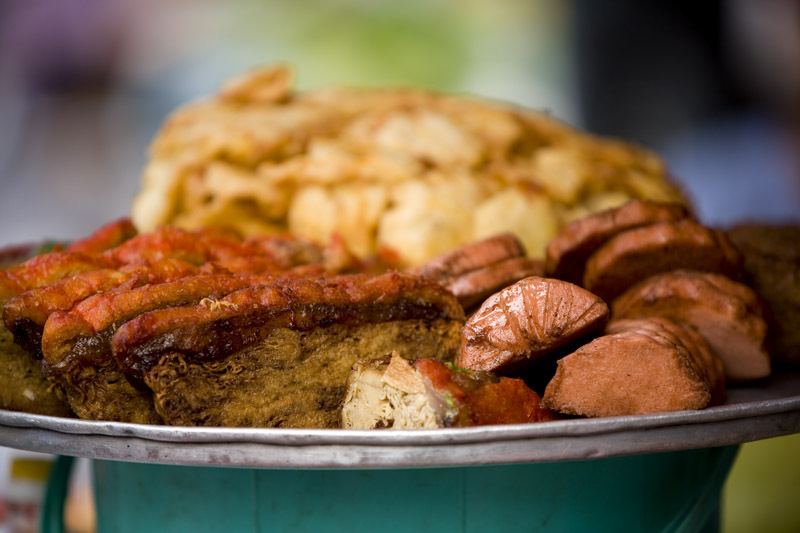 Miss these comfort food from HCMC. 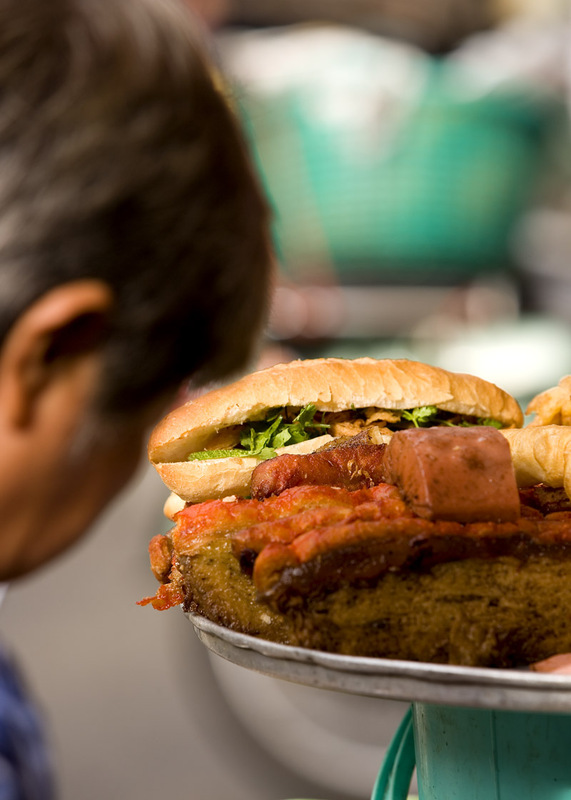 I'm only familiar with the banh mi in Vancouver but my favourite was always the meatball one! It is in a light red/orange sauce which didn't taste like barbecue sauce. I wish we could have had grilled pork... the toppings were limited to cold cuts or the meatball. Tsk... You're really trying to piss me off, huh? I just get back from a trip, dig back into food blog world and this greets me. Can't you preface your posts with a warning or sommit? Have you any idea of the pain inflicted knowing I can't get this stuff without flying half way across the world to find it... gah. Will catch up on the rest of you blog posts when I've finished this bottle of appetite suppressants. the meatball is what Vietnamese call Xiu' Mai. . The red sauce is tomato sauce. 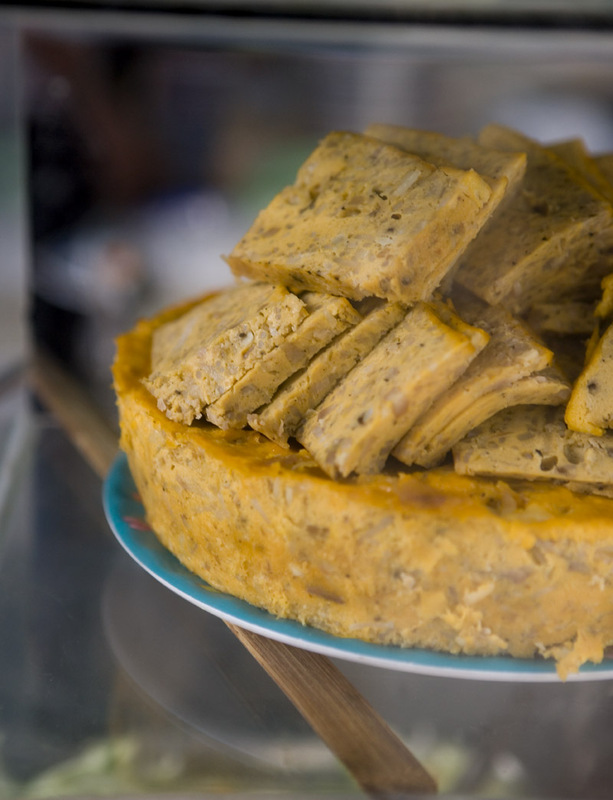 THe ingredient for the Frittata-like cake is ground pork, egg, glass noodle, black wood ear fungus (and some time crab meats) . Which kind of optical lens and digital camera did you use? Did you have a create a book of ur pictures? hi, thanks for an awesome post. I really enjoyed reading it.